The Kelowna Rockets erased a 3-2 Spokane lead with three unanswered goals on their way to a 7-4 win over the Chiefs on Wednesday night in Kelowna, B.C. 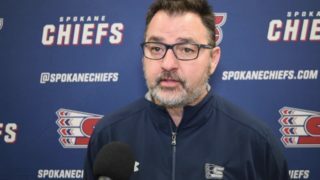 The loss left Spokane 0-3 on their 3-game road trip as the Chiefs saw their record fall to 9-10-1 on the road. Kelowna jumped out to a 2-0 lead in the first period before Spokane would cut the lead in half at 18:27 of the period on Jeff Faith’s fourth goal of the season. Matt Leduc and Luke Toporowski picked up the assists. Spokane would come out and score just 19 seconds into the second period on a Tyson Helgesen slap shot to even the game at two apiece. The Chiefs would take the lead at 2:11 as Jaret Anderson-Dolan scored his team-leading 23rd goal of the year on the power play. The Rockets would come back and tie the game just 1:26 later on a Nolan Foote goal. 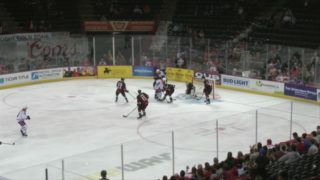 Kelowna would re-take the lead on a Cal Foote power play goal late in the second to go ahead 4-3 after two. The Rockets would score their third unanswered goal off a 4-on-4 situation at 7:53 of the third to take a two goal lead at 5-3. Spokane would answer back as Filip Kral found Zach Fischer for his 19th of the year at 15:41 to bring the Chiefs within 5-4. 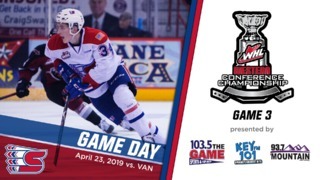 Kelowna would score two goals 49 seconds apart in the final two minutes to cap off their second-straight win over Spokane in the season series with a 7-4 victory. 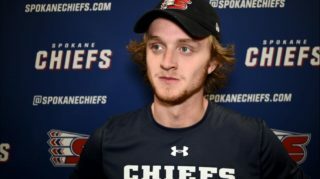 The Chiefs outshot Kelowna 32-25, including a 9-5 margin in the third, as Spokane finished 1-for-3 on the power play and 1-for-2 on the penalty kill. The Chiefs return home to open a five-game homestand on Friday night at 7:05 p.m. when they host the Prince George Cougars. Mike Boyle will have the call on 1510 KGA starting with the pre-game show at 6:30 p.m. 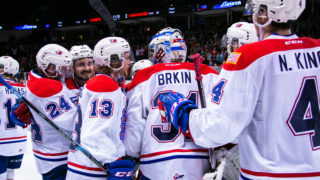 The Chiefs return to Spokane Arena on Friday, January 12 to face the Prince George Cougars! It will be Washington’s Lottery Night at the Arena as one lucky fan will walk away with a grand prize courtesy of Washington’s Lottery. 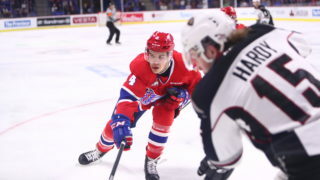 Tickets for Friday night and all Chiefs home games are available in-person at the Chiefs’ Ticket Office, over the phone at 509-535-PUCK and online here.